Want to add more attributes in your Shapefile to respective feature? QGIS an open source tool, which I recommend to every Geographer for use, can give you direct solution. Sometimes we need to join more attribute to a GIS vector files which ultimately provide more power to you for analysis with more attributes. 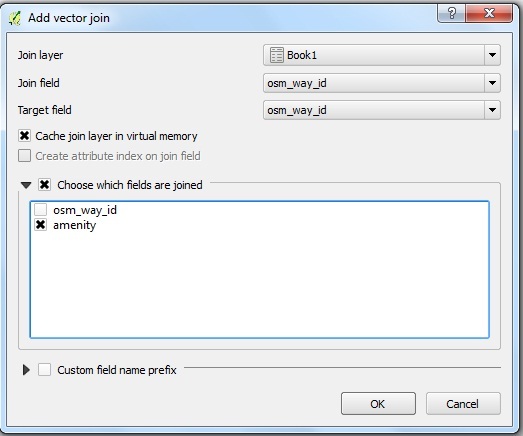 For joining two file to add more attribute you need to have a common attribute field in both the files, same as like you need to have primary and foreign key to join two table data in SQL. 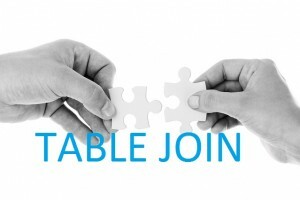 QGIS provide us the facility to Add more table attributes with joining two files . 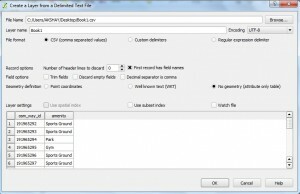 You may also be intereset to see how to perform Spatial Join in QGIS and other tutorial in QGIS. We are performing this steps with Shapefile and csv file, while you can also perform the same steps with other GIS vector file and csv file. 1.) Open QGIS and add a shapefile and observe its attribute table. Here we have two columns. 2.) 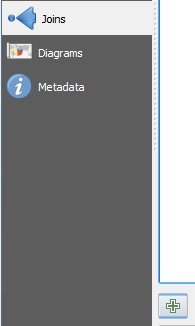 Now We have a comma separated file(.csv) which has to be added. 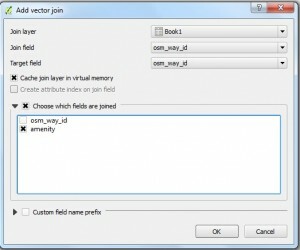 Having two columns i.e osm_way_id and amenity as shown below. in the file. 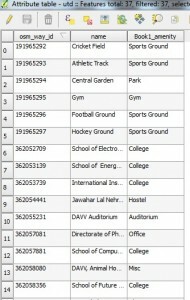 We can see that osm_way_id is the column which is common in attribute table of shapefile and .csv file. So we can join this two using the same. 3.) First we have to import this file in QGIS. 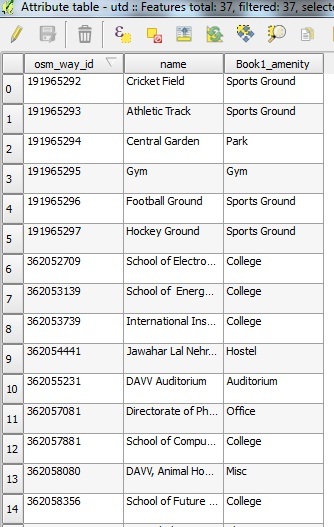 QGIS provide us the facility of importing files which do not have any geographic information also. While importing .csv file we have to take care that default type for .csv file is string if .csvt file is not present in the folder. 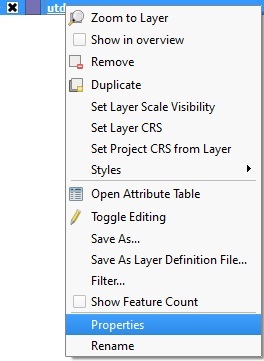 QGIS will look for .csvt file for data type in the same folder of same name. If not found all the data would be imported as default type i.e String. Now here all the columns are string so we are not creating a .csvt file. 4.) Lets import this file in QGIS. Click layer than Add Layer and select Add Delimited Text Layer. 5.) 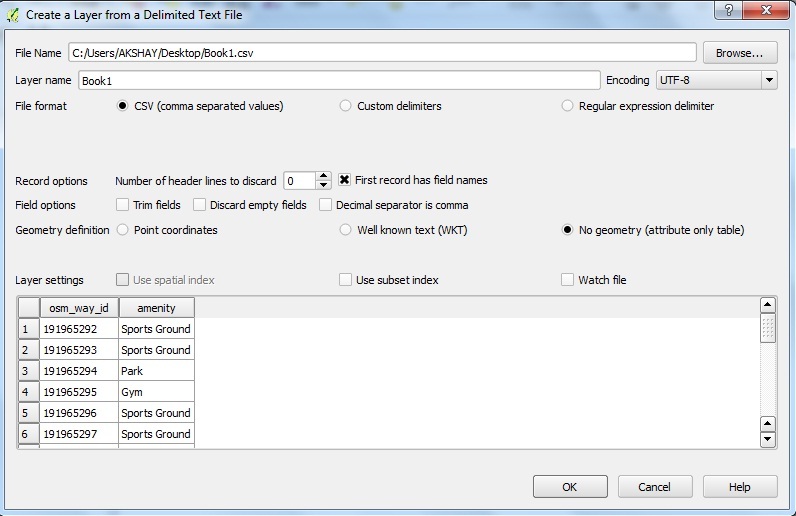 Select csv radio button and then select no geometry radio button. 6.) Click ok. The file is imported. 7.) Let’s join both tables. Open properties dialog box of the layer for which we want to perform join. 9.) Click on plus sign. 10.) Set the dialog box as in the image. We have chosen the field according to which we want to join and the field which we want to join with the table. By default all the fields are added. 12.) Click ok for properties dialog box. 13.) The tables are joined. 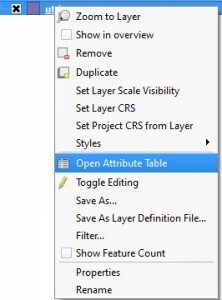 Open the attribute table for the layer for which you performed join. The column name Book1_amenity shows that it was imported from Book1. 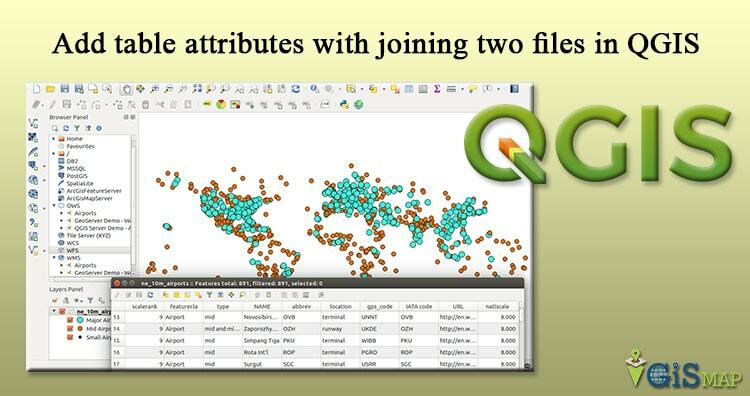 Comment below if you are facing any problem in adding attributes data to respective features in QGIs with Join function. It’s really a nice and hluefpl piece of information. I’m satisfied that you simply shared this useful info with us. Please keep us up to date like this. Thanks for sharing.